Synchronicity is described by Carl Jung, who coined the term, as "an acausal connecting principle": the term is generally used to describe seemingly meaningful coincidences. What I found were "coincidences" which were connected so meaningfully that their "chance" concurrence would be incredible. By way of example, I shall mention an incident from my own observation. 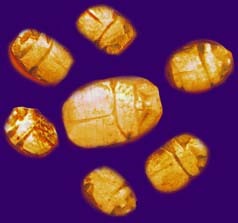 A young woman I was treating had, at a critical moment, a dream in which she was given a golden scarab. While she was telling me this dream I sat with my back to the closed window. Suddenly I heard a noise behind me, like a gentle tapping. I turned round and saw a flying insect knocking against the window pane from outside. I opened the window and caught the creature in the air as it flew in. It was the nearest analogy to a golden scarab that one finds in our latitudes, a scarabeid beetle, the common rose-chafer (Cetonia aurata), which cointraryt to its usual habits had evidently felt an urge to get into a dark room at this particular moment. I must admit that nothing like it ever happened to me before or since, and that the dream of the patient has remained unique in my experience. When events in the "outer" world appear to us to correspond to states of mind and heart in our "inner" world, are we witnessing a purely random phenomenon with no intrinsic meaning, or "meaningful coincidence" -- i.e. a patterning of the world at cross-purposes to "cause and effect", which we can perhaps view as the hand of Grace, the calligraphy of God, or an example of the Hermetic postulate, "as above, so below"? There are few persons, even among the calmest thinkers, who have not occasionally been startled into a vague yet thrilling half-credence in the supernatural, by coincidences of so seemingly marvellous a character that, as mere coincidences, the intellect has been unable to receive them. Chains of more-than-coincidence occur so often in my life that, if I am forbidden to call them supernatural hauntings, let me call them a habit. Not that I like the word 'supernatural'; I find these happenings natural enough, though superlatively unscientific. And once again Fate fixed the scales for shocks and surprises, arrivals and departures. And all the while these two solitary strollers did not for a moment think on coincidence, that unswum stream which lingers at man's elbow with every crowd in every town. Nor did they ponder the fact that if man dares dip into that stream he grabs a wonder in each hand. When I pray, coincidences happen; when I don't, they don't. A lot of people don't realize what's going on. They view life as a bunch of unconnected incidents and things. They don't realize that there's this like, lattice of coincidence that lays on top of everything. I'll give you an example. Show you what I mean. Suppose your thinking about a plate of shrimp. Suddenly, somebody'll say like, plate, or shrimp, or plate of shrimp. Out of the blue. No explanation. No point looking for on either. It's all part of the cosmic unconsciousness. Did you do a lot of acid, Miller? Back in the hippie days? -- From the film "Repo Man"
One of my own most impressive experiences of synchronicity had to do with the book Carl Jung co-authored with his one-time patient and friend, the Nobel laureate physicist Wolfgang Pauli, under the title The Interpretation of Nature and the Psyche -- in which his essay, "Synchronicity: An Acausal Connecting Principle", is found. I was a "book scout" at the time, one of those lowly folk who trawl yard sales and library sales to find the occasional "rare book" which can be bought for a song and resold at a profit to a dealer in such things. It's a fascinating job -- perhaps the closest thing to a treasure hunt that one can imagine as a paid occupation for adults -- and of course one makes many friends with others who are "scouting" or "dealing in" rare books. Once at a library sale, I found a very nice book for a dollar -- a bibliography of the works of Thomas Hardy -- which I could not doubt have sold for $8 to a dealer who would have resold it for $20. But one of my companions at that sale was a book dealer who happened to collect Hardy, and at breakfast after the sale I gave him the bibliography: he tried to offer me money for it, and I refused, saying it just seemed to be his book and I was happy to make him a present of it. For months thereafter, whenever I came into his bookstore, he would tell me he was looking for a book to give me in return, a book which would be perfectly suited to my own collecting interests as the Hardy bibliography was to his -- he used the phrase "a book to die for" -- and I would remind him that it should be a book he'd purchased for a dollar or less. It was indeed a "book to die for" in my terms -- Jung's essay on Synchronicity, in a first edition signed by Jung's co-author, Pauli -- and brough to me by the apparent "chance" (read "meaningful coincidence" or "synchronicity") of my having found my friend a similarly appropriate "book to die for" at that booksale some months before. I was delighted -- not least by the "synchronicity" that the book itself was about synchronicity. And my joy was only intensified when I discovered -- again by "chance" -- that the "Max" to whom Wolfgang Pauli had dedicated this particular copy of the book was his young friend Max Delbruck, a later Nobel laureate whose work was hugely influential in the solution of the structure of the DNA molecule. As Jung himself says, such things leave an indelible impression on those who experience them. I felt as though Grace had once again nudged the details of my life in such a way as to show me with a certainty beyond proof that I was and am not an isolated individual, but an integral part of the far vaster "web" of all that is -- a web which I find consistently more "intelligent" and "gracious" than I am. Technically, Jung's term "synchronicity" refers specifically to those apparently meaningful coincidences which connect our inner and outer lives (the scarab appearing at Jung's window at the very moment when his patient is recounting a scarab dream; the gift of the book on synchronicity appearing as an example of the psychic phenomenon of synchronicity which passionately introgues me). Synchronicity is not merely coincidence, in other words, but coincidence which specifically bridges the "subjective" and "objective", "inner" and "outer" worlds. I used to believe that everything that appeared synchronistic was really just a coincidence. Then I had an experience that perhaps built upon previous information but it changed my beliefs and perceptions profoundly. I was in London and woke up at 6 am in a strange flat, which belonged to some people I had me at a nightclub the night before. I decided to go all the way across town with my video camera to take some shots of Tower Bridge which was part of a cherished film I had made years before and subsequently lost forever. However, when I got to Tower Bridge, I decided to blow off getting the footage and wondered up a winding side street. I had no idea why I had gotten up so early after a late night, where I was going or why I was going in that direction. I looked up and saw a young woman walking towards me. As she approached, I recognized her as my friend Heidi. She had moved to London two years previously and we had lost contact with each other. We practically walked into each other and when she recognized me, we both stopped and she spoke first saying, "Oh my God, I never come this way." I felt the synchronicity supersede any idea of coincidence in my bones, instantly. Since then I don't much believe or think in coincidences and find that my thoughts on synchronicity perpetuate my experiences of synchronicity.